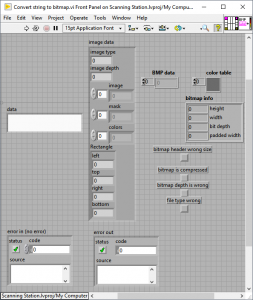 This vi simply transform a bitmap string to LabVIEW image. I used basic LabVIEW function that already exist in read BMP file. Mostly for fun, I have concocted a way of acquiring video using Labview for Linux, to mend for the unavailability of IMAQdx on Linux. The idea is to grab via v4l2 (http://linuxtv.org/), actually through the handler libv4l2, and to display simply via the picture control. The package includes wrapper VIs to the public functions of libv4l2.so, high level, grabbing oriented VIs, convenient ancillaries and v42l typedefs. 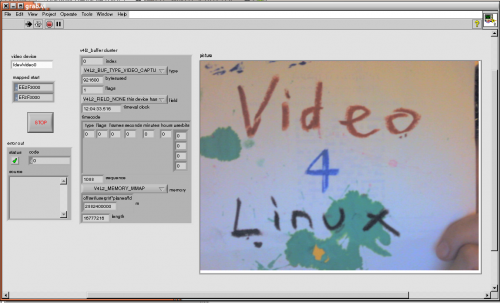 A proof of the concept webcam grabber, essentially a translation of the Appendix E example to the linuxtv API, is also included, as well as the trace of the process used for automatically building the typedefs employed. During the development, this was tested successfully with webcams at different resolutions on versions of LV from 2011 to 2015, on different installations of Ubuntu 64bits, from 12.04 to 14.04. This means, using v4l-utils from originally 0.8.6-1ubuntu2, 32bit, till 1.0.1-1, 32 and 64bit. 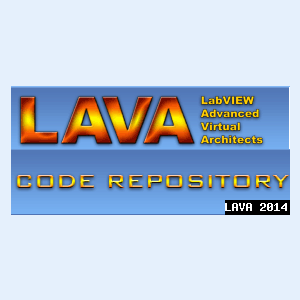 The files are currently saved for Labview 2014 32bit, and can be run by Labview 64bit if a preliminary script, regenerating some of the typedefs, is run (details in the README). This library provides an LVOOP-based interface to the powerful cross-platform ImageMagick image handling utility suite. It supports all of the ImageMagick utilities and almost every command-line operator (over 200 of them) with support for custom user-specfied operators for the edge cases. 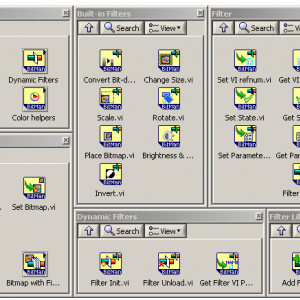 Several examples are included that demonstrate basic text & image creation, composition, and conversion in and out of LabVIEW (including VI icon creation). The first thing you need to know about ImageMagick is that it has a pretty steep learning curve. Complicated things are complicated, and easy things are sometimes complicated, too. The Example VIs provided with the project are intended to give you a basic start on how to use the library, but you should expect to consult an ImageMagick Examples Page frequently. The library is written for cross-platform usage, but is currently limited to compatibility with Windows because I don't have any non-Windows LabVIEW machines to write the platform-specific code on. If you can help out with compatibility for other platforms, please contact me. I would LOVE to hear from you. Currently applications built against this library throw a litany of execution errors when run in the RTE. If you need to build these libraries into an application, please contact me and I will try to help you. Functions for a few of the built-in pattern generators are not completely implemented. You can access them using a custom raw operator argument. 1.0.1: Fixed an incompatibility with ImageMagick 6.3.4 when using certain operators. Added a better error message when ImageMagick can't be located under Windows. Library contains few basic built-in filters. Their design concentrates on the versatility, ease of use, and the clearance of the code. This results in a decrease of efficiency and consequently, processing of large images using standard filters may be slow. But this is not a limitation of the framework and it is possible to create user filters, which may - as a more specialized - operate much more efficiently. Built-in filters are good for processing of relatively small images and can be used to support programming user interfaces, operations on the icons, creating graphical documents, etc. Library was written using object-oriented programming techniques (LVOOP). This VI uses the NI-IMAQ for USB drivers to continously acquire an IMAQ image. The USB camera is selected from a list generated from the "IMAQ USB enumerate cameras" vi. Grab rate is controlled using an event structure. This is so that image processing routines can use other event cases. 1.0.1: Fixed list control to select camera, improved error control. This VI provides a simple batch image conversion interface to the ImageMagick 'convert' utility. It converts and resizes groups of images specified by the user (it was originally developed for organizing documentation screenshots). Be warned that this is a pretty simple VI. It has basic error reporting & handling. It should serve as a starting point for people who want to explore the usage of ImageMagick with LabVIEW. This VI is Windows-only (the registry lookup and calling syntax are OS-specific), but it would not be difficult to adapt to other OSes. A working Windows ImageMagick installation.